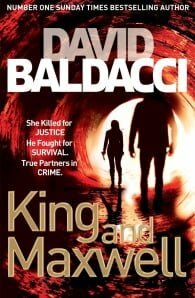 Sean King and Michelle Maxwell – former Secret Service agents turned private investigators return in their most surprising, personal, and dangerous case ever . . .
“Michelle had chased many things in her life. As a track star and later Olympic rower, she had constantly pitted herself against others in races. As a cop in Tennessee she had run down her share of felons fleeing the scenes of their crimes. As a Secret Service Agent she had been fleet of foot next to limos carrying important leaders. King and Maxwell encounter teenager Tyler Wingo when he has just received the tragic news that his soldier father has been killed in Afghanistan. But then Tyler receives an email from his father . . . after his supposed death. Sean and Michelle are hired to solve the mystery, and their investigation leads to deeper, even more troubling questions. Could Tyler’s father really still be alive? Was his mission all that it seemed? Has Tyler’s life been a lie, and could he be the next target? It’s clear that King and Maxwell have stumbled upon something even more sinister when those in power seem intent on removing them at any cost. Determined to help and protect Tyler, their search for the truth takes them on a perilous journey which not only puts their lives at risk but arrives at a frightening conclusion.